CapFlow is a bank-independent company that specializes in the pre-financing of sales, the purchase of goods and the stock financing of medium-sized companies. The capital is made available flexibly and adapted to the respective company situation. The capFlow offer differs from other forms of financing (such as factoring) and offers considerable advantages in terms of flexibility and implementation possibilities. In addition to capFlow, WORDUP PR has already advised a large number of other FinTech / Financial Services clients in the past few years, including Bankhaus August Lenz, Lehel Invest Bayern, Lehel Trade Partners, yavalu, Cadis, C1Fincon and many other customers. This is why this topic is part of the Agency’s special expertise in public relations, especially when it comes to innovative and flexible financing solutions for medium-sized businesses in Germany and internationally. The agency regularly transports the topics of these clients successfully through financial specialist media, the relevant medium-sized press as well as German leading media (print, TV and radio). 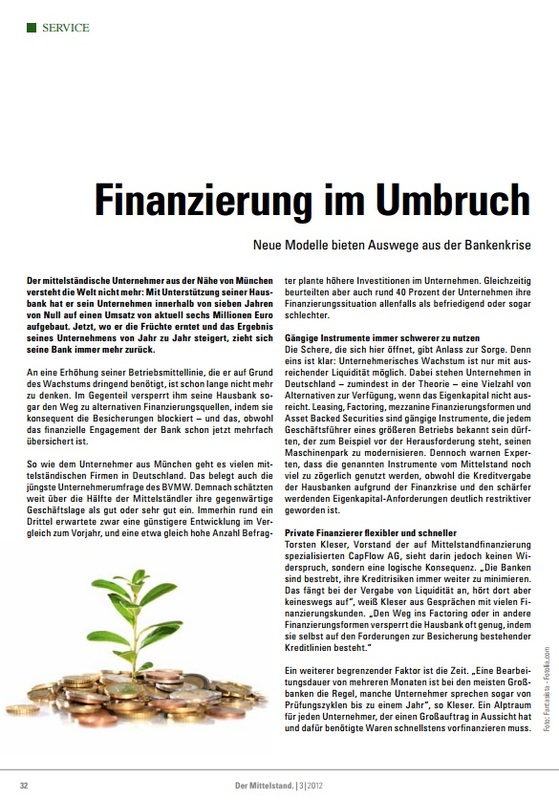 CapFlow im Magazin "Der Mittelstand."